The final round of Mendennick Solar Funding is now available. Applications are welcome from charities, social enterprises and community groups. What is the Mendennick Solar Community Fund? 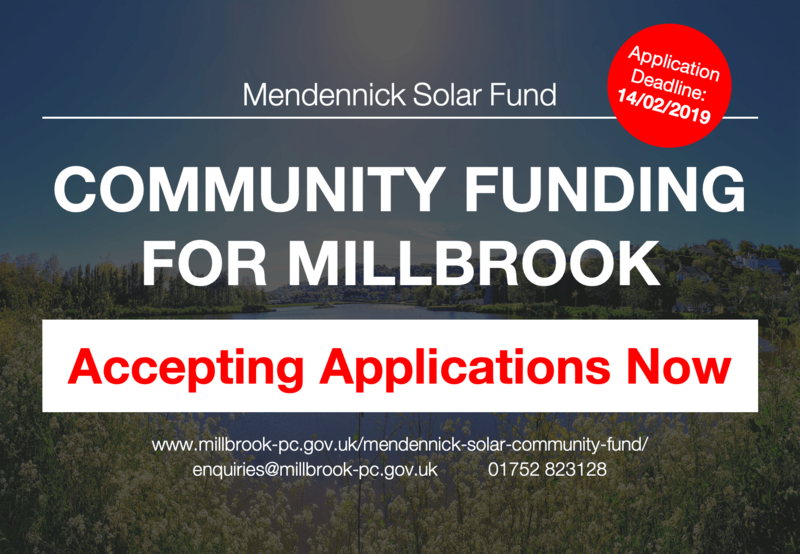 Set up in 2016, it is a community benefit fund provided by the Mendennick Solar Farm and administered by the Mendennick Solar Fund Committee, on behalf of Millbrook Parish Council, for good causes in Millbrook. Over the course of 3 years, between 2017 – 2019, the committee will award £30,000 of grants to community groups and initiatives in Millbrook. There is no maximum grant that may be awarded to any single group or project. To apply, applicants must first have a written constitution, set of rules, or governing document and a bank or building society account, with a minimum of two signatories in place, before applying for a grant. However, in exceptional circumstances, consideration will be given to groups that do not meet this criteria. Next, applicants must complete the funding application form, which can be downloaded here or printed copies may be collected from the Council Office in the Village Hall (open Mon – Thurs 9:30am – 5pm / Fri 9:30am – 1pm). The closing date for applications is 14 February 2019. The full funding criteria, judging process and procedures can be downloaded here. The committee will meet in February 2019 to review all of the applications received. Successful applicants will be notified thereafter. If you would like a word version emailed to you, please contact the Clerk on 01752 823128 or by email to enquiries@millbrook-pc.gov.uk.